The 70-662 Real Practice-Lab will provide you the necessary platform to gain hands on skills in Exchange Server 2010. By completing the lab tasks you will improve your practical skills installing, managing, monitoring, and troubleshooting Exchange Server 2010, managing messaging security and recovering messaging servers and databases. Becoming proficient in these tasks will also help you understand the objectives and competencies required by the MCTS: Microsoft Exchange Server 2010, Configuration certification exam. Using the Real Practice-Lab to its full potential will help you develop your skills in either becoming a messaging support engineer or help you develop your current skill level. Once you have used the lab for either 25 / 50 or 100 hours we will acknowledge this achievement by issuing you a certificate. This can be validated by potential employers or managers alike. Install and Configure Microsoft Exchange Server: No need for your own equipment or licenses as this is all available and ready for you to use. Complete all the key objectives in order to install Microsoft Exchange Server 2010 like preparing the infrastructure/server components, provisioning databases and address lists. Configure Recipients and Public Folders: Manage your own messaging environment by understanding the different types of mail enabled objects in Exchange 2010 and what you can do with them. This is a fundamental task for anyone wanting to support an organisations Microsoft Exchange Server environment. Also discover how to effectively manage and configure public folders, RBAC and distribution groups. 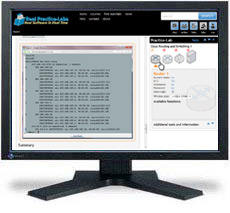 Message Transport: Use your Real Practice-Lab to configure the message transport role and its supporting components such as transport rules, hub/edge transport and message routing. It is vital that these are deployed correctly in your messaging environment to ensure successful delivery of email. If you are new to MS Exchange 2010 it is important that you understand the new role topology and using your lab extensively will help with your skill development. Message monitoring and Reporting: Now that your Exchange 2010 servers are implemented and operational you can learn the common administrative tasks that will help identify and remediate any potential issues. Using the built-in tools within MS Exchange Server you will be able to monitor mail queues, monitor system performance, perform message tracking and monitor client connectivity. Once you have discovered how to use these functions effectively you will be able to create server and usage reports. Recovery options: One of the key areas of any service is having the ability to recover it quickly and efficiently in case of a failure. Use the lab to configure these options and test strategies for backups, recover messaging data and server roles. Message Compliance: Most organizations want to ensure to the best of their ability that the integrity of their outbound and inbound email communications. This includes that emails are free from anti-virus and anti-spam and that emails adhere to the organisations compliance policies. Using your Real Practice-Lab you can manage and edit the relevant components in Exchange Server 2010 so that you become fully versed in implementing these into a production environment.